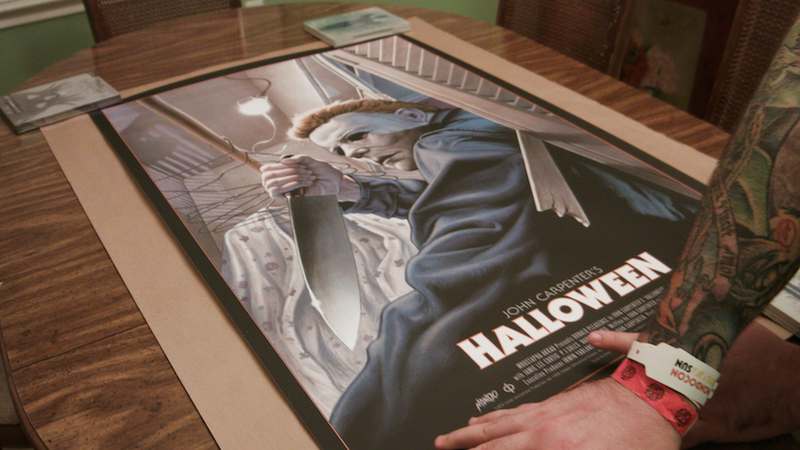 24x36: A Movie About Movie Posters is a new documentary from Snowfort Pictures and director Kevin Burke that delves into the production of these posters, which are more breathtaking works of art than the word "posters" could ever describe. A niche market for high-quality, limited-run movie posters has popped up in the last decade with no signs of slowing down. If you're one of the fervent collectors of these beauties, you know the names Mondo, Skuzzles, Grey Matter Art, and the like. To see one of these prints up close is to know rapture. I'm not kidding. If you think the art posted online for sale is a good representation of what these collectors drool over, you're only getting half the picture. (Yuk, yuk.) The screen printing process reveals so many varied intricate details in hand -- from the vibrant colors to the line work, these art pieces are truly gorgeous. And this is partly what 24x36: A Movie About Movie Posters wants you to know. The doc reveals how screen printing works, which was cool to see in action. More revealing is the exploration of the fandom surrounding these art prints, which have their origins in artistic gig prints and were born out of love for movies and art. Just look at the Halloween art print above. Look and weep. Anyway, in the doc, we get to hear from a ton of the insanely talented artists that create these illustrations, such as Jason Edmiston, Phantom City Creative, Akiko Stehrenberger, and Gary Pullin. We hear from the art directors and "publishers" (for lack of a better word) of this art on why the work is so popular and why -- or why not -- the prints are numbered and limited. There's an interesting difference of opinion here between most of the artists represented in the film who lean toward the limited works, and the very vocal opinion of one who does not. Every reason they each give is valid, and it's this objective representation that makes you think. There's history on the beginnings of movie posters here as well as a look into more of a golden age of illustrative work done from the '60s through the '80s. And then there's the laughable and sad "floating head" images that scream out who's starring in the film but often bereft of any creative marketing whatsoever. I'd have loved to have seen a detailed look at an artist creating one of these prints, from sketch to market. Of course, not everything can go into a finished doc, as there's always a ridiculous amount of footage to whittle down. Perhaps we'll be treated to a bonus feature of that kind on the DVD/Blu-ray release. Now if you'll excuse me, I'm off to Fantastic Fest 2016 and the following release of Phantasm Re-Mastered -- and the limited Mondo print that'll be release directly afterward. Intrigued? Check out the trailer for 24x36: A Movie About Movie Posters below. 24x36 - A Movie About Movie Posters - Teaser Trailer from Post No Joes Productions on Vimeo. Thanks for sharing this. I'll keep an eye out.